Secret documents hidden in the library of the Rosicrucians reveal humans’ mysterious past and the inevitable future of the human race. What was the function of the pyramids? How and why was Atlantis destroyed? Who are the guardians of the secret wisdom? Were did our creators come from? 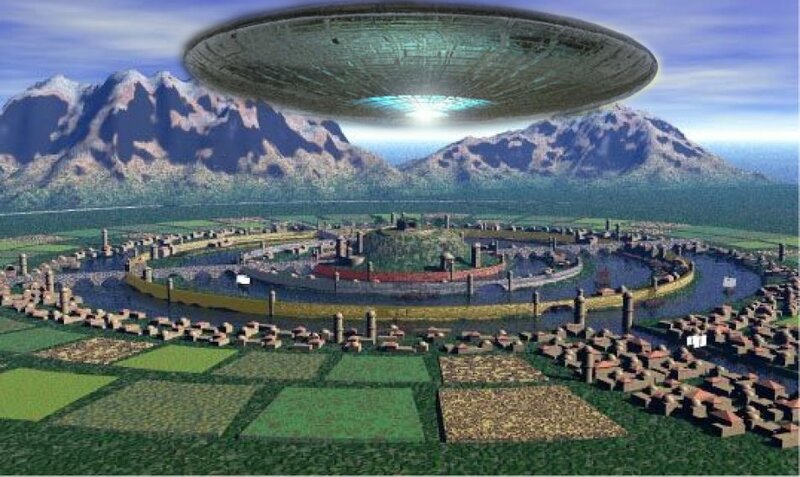 As our readers already know from our previous articles, after the destruction of Atlantis the Shining Ones a group of highly advanced extraterrestrial beings who were our creators and later became worshiped as gods, were scattered over all continents. The Shining Ones continued their mission and assisted and guided humans in their development. They shared their knowledge and taught man agriculture, medicine, astronomy, mathematics and everything that was needed for our survival as a species. The Shining Ones were a superior race and much of what they could accomplish seemed like “magic” to our ancestors. However, these alien beings were no magicians. On the contrary, many of them were skilled scientific technicians. The scientific and technological knowledge of the Shining Ones was and still is beyond our comprehension. This remarkable alien civilization was fully aware of the danger of revealing all of its knowledge to the humans who were considered a less developed species. Therefore, the Shining Ones’ secret knowledge was passed on but only to a group of carefully chosen individuals, like pagan priests and initiates of the secret wisdom. The secret knowledge of the Shining Ones survived until today, but the teachings of the gods are not easily accessible to any ordinary person. This extraordinary and extremely valuable knowledge has been written down and is locked behind closed doors that are very difficult to open. The Vatican library is not the only place that is full of secrets. There are also some secret societies that possess unique knowledge of our planet’s history. Today, I would like to write a little about the secret knowledge of the Rosicrucians, a society of mystics, formed in late mediaeval Germany. According to secret documents in the library of the Rosicrucians, the Greek philosopher Plato (427 or 428 – 347 B.C) was a depositary of the Atlantean tradition and his account is genuine. Part of the teachings of the Rosicrucians have been revealed to the order’s members by the French Grand Master Raymond Bernard (1923-2006). “Colonized” people received knowledge in keeping with their capacities. In particularly “open” countries, a direct relationship was established by the College of Sages, that is, the highest initiates of the time, guardians of the secret wisdom, and this relationship was marked by a pyramidal temple in the image of the supreme pyramid where the College had its seat in Atlantis, and where its knowledge was preserved. Only one pyramid, however, has reproduced the supreme pyramid , and even then in a different “measure”; what is known as the Pyramid of Cheops. It perpetuates in the face of the world the totality of Atlantean wisdom, whereas others reveal only part of it. In the rather near future, “discoveries” beneficial to mankind will put an end to many arguments. The Atlanteans knew the nature and power of certain cosmic forces, particularly telluric currents, and carefully applied them to agriculture and the harmonious maintenance of the overall balance of these currents, to avoid all geological catastrophes that it was within man’s power to avert. The pyramids also fulfilled this function because of the duly studied locations in which they were built. Elsewhere, points of protection were sufficient. This was the case, for example, with dolmens and menhirs. They precisely marked places of conjoined forces and focalized universal energy, where efficacious ceremonies could be held. It was the same with megaliths, many of which can still be seen all over the world in estates, fields, and even cities; but their sole function was to amplify cosmic energy and improve harvests. When the supreme pyramid had been unfavorably altered as the result of ignorant and ambitious intrigues, the planetary catastrophe that engulfed Atlantis transformed the surface of the earth and became engraved in the folk imagination under the inaccurate name of the Deluge. In the basis of the teachings of authentic African secret societies, a particle of the Atlantean wisdom has been preserved. The sages did not reconstitute the Empire, because of what happened and because this in accordance with the universal plan. It is the whole world that is called upon to become the New Atlantis… The human will is always free. Once again, and for the last time, mankind will face an ultimate choice from which will result either an era of extraordinary civilization or the end, not of a continent this time, but of the world. This time of choice is approaching. It will be marked b the reappearance of Atlantis, the resurgence of the vanished continent before the astonished human race. Copyright © MessageToEagle.com & Ellen Lloyd All rights reserved. This material may not be published, broadcast, rewritten or redistributed in whole or part without the express written permission of MessageToEagle.com and Ellen Lloyd. Ellen Lloyd is an author who has spent more than 20 years researching ancient mysteries, sacred texts, and the UFO phenomenon. She the author of Voices From Legendary Times in which she demonstrates that races of men have inhabited Earth for millions of years, but not all of them were human. In addition, Ellen has written several hundreds of fascinating articles about prehistoric alien visitations, ancient mysteries and alternative history.